On Friday, December 7, 2012 Vera Bradley kicked off a preview of Summer 2013 a select Vera Bradley stores. I was lucky enough that one of the stores near me was part of the preview so I was able to get some bags so I could share these new colors with all of you. These will be released March 21, 2013. Below is a slideshow of all of the prints including the inside prints! Here are the descriptions of the colors from the survey Vera Bradley did earlier this year. The only change I noticed is that Sun Valley is navy blue, not charcoal. Craft meets couture in this folk art inspired pattern reminiscent of the Art Nouveau period. Artfully arranged bell-shaped flowers, in soft pinks and bright orange, curl and climb on a spring green vine to construct a unique perspective on a sweet floral. A punchy range of paisleys adorned with simple florals and lacy scalloped edges in soft vintage tones. A nouveau combination of pretty pinks, teal and citrus hues on mint green ground give it a perfect retro flavor. Charcoal, rust and a shot of citrine lend earthen appeal to the boldly patterned motifs of tribal-infused designs. Primitive elements mix with crisp white to card out a path less traveled. A pool of paisley swirl, like a silky summer scarf, in a nautical palette. Denim blue, crimson, turquoise and daring yellow add a playful touch to an otherwise sophisticated print. Which color are you most excited about? Marina Paisley appears to go with my summer clothes. I wear a lot of red, white and blues in the Summer. I also like the design the best. I may just stick to Summer Cottage, we'll see. I like tutti fruitti but I want to see it in person. Tutti Frutti is my favorite - I like the mint background! i love them all, I agree that the mint background is gorgeous but the paisley print on it isn't exactly screaming my name. Marine Paisley for sure though is !! I like Tutti Fruiti maybe, not lovin' any of them but I'll have to see in the store. Oh my gosh, I've probably said it before, but it deems repeating on these prints- Why doesn't VB do more reversable items!?! The inside prints are half the fun. Not interested in any of these prints... maybe Fall 2013 preview will be better. When can we expect that? 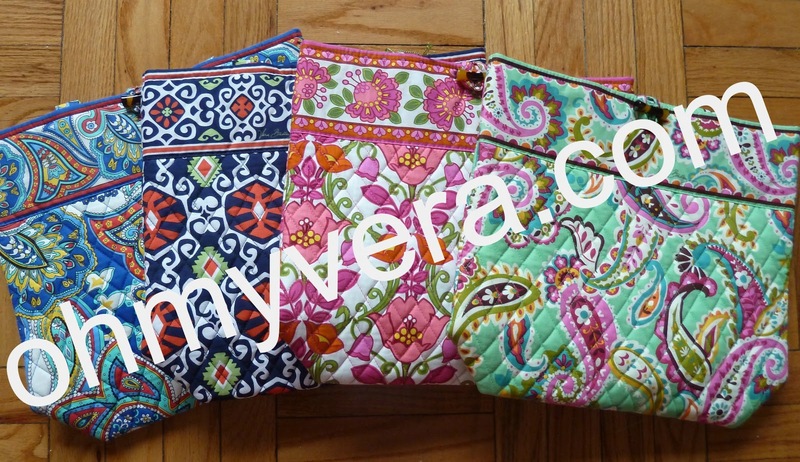 These are all really ugly and out of keeping with what Vera usually has - except for Tutti Fruitti. Marina Paisley is almost close to acceptable but the white background doesn't work and is too much like Mediterranean White. They REALLY fell off the wagon with English Rose, Ribbons and Dogwood too - old lady prints - who would ever be seen with those???? Old ladies don't even want those! Please, we need to liven things up for the future! Are you 10 or something? English Rose and Dogwood are really quite classic style prints and every now and then Vera comes out with some of those (Versailles, Medallion, Barcelona)and they're a hit! All of those prints are selling and sold like crazy. From a business and fashion perspective they NEED to come out with BOTH timeless patterns and younger styles like Daisy Doodle and Lime's Up. I agree with Juliet. I could really appreciate more reversible bags! Looking at the video, my favorites were the inverted Sun Valley and Tutti Fruiti. What a nice contrast between the bold ribbon stripe and the more demure body of the bags. In fact, lots of their older patterns from the 90s are reminiscent of that style. I think VB patterns have gotten a little 'busy looking' in recent years, and that's come with mixed results. I won't be buying any of them. They are all florals...again. Why does VB make something other than florals? I have had about 20-25 'on the go' style bags and they are starting to look the same. I wish they would do a print with sea horses or lobsters...or anything other than the same-old same-old. I agree Melissa. Seahorses would be great and as you said, same old-same old. A bit disappointing. I'll be waiting for Fall for the colors. Hopefully we'll get something new and interesting. There hasn't been anything I really love recently.